Shangri-La Kerry Centre Hotel Beijing is a five-star hotel offering travelers legendary luxury hospitality in an informal ultra-chic environment. 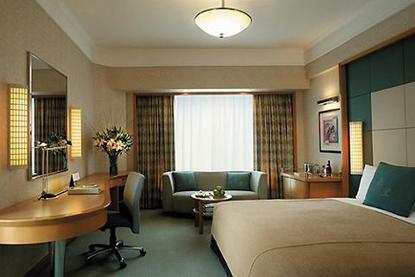 Located in downtown Beijing within the Central Business District the hotel offers easy access to the commercial - shopping and historical sightseeing spots of metropolitan Beijing including the Forbidden City - Tiananmen Square - Heavenly Temple - Lama Temple - Ritan Park - Pearl Market - Silk Market - and Friendship Store. Beijing Capital International Airport PEK/BJS is 17 miles northeast - a 30 minute drive - from the hotel. Onsite dining options include The Horizon Chinese Restaurant - Coffee Garden - award winning 24-hour bar Centro - and gourmet cafe and wine bar Bento and Berries. Health facilities include Beijing largest - 6000 square meters of space including a gymnasium - 35 meter indoor swimming pool - indoor tennis - and 235 meter jogging track. Kerry Center is often the preferred choice for star-studded galas - official meetings and world conventions with its unsurpassed hardware and nearly 6000 square meters of meeting space. The hotel also offers several 24 hour services - including room service - concierge -doorman - front desk - laundry - car rental - wireless internet - and airport transportation. There are 487 well-appointed rooms and suites with high ceilings - wood finish - and light color palette. Luxury amenities include hi-speed internet - data port - large executive desk - marble bathrooms - toiletries and more. Horizon Club rooms include buffet breakfast - all day beverages - evening cocktail hour - as well as other services and amenities.